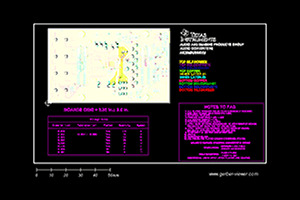 The TIDA-00178 reference design is an EMC compliant industrial interface to Sin/Cos position encoders. Applications include industrial drives, which require accurate speed and position control. The design utilizes a 16-bit dual sample ADC with drop-in compatible 14- or 12-bit versions available, allowing for optimization of performance and cost. 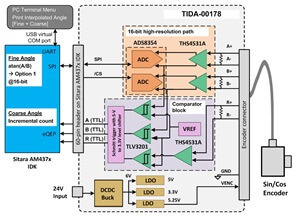 TIDA-00178 provides a direct connection to Sitara AM437x using SPI and QEP. For quick evaluation it features a 60-pin connector which directly fits the AM437x IDK. An example firmware for Sitara AM437x IDK is provided, which outputs the measured angle from the Sin/Cos encoder with up to 28-bit resolution through the Sitara’s USB virtual COM port.